​ THIS PAGE CONTAINS INFORMATION ON RESERVING TIME IN ANY OF GLASSROOTS FOUR STUDIOS AND UTILIZING EQUIPMENT. ​ Our studios are open to any qualified artist who wants to rent time and equipment. Please call for more information or to schedule rental times. To schedule rental time, please call 973-353-9555 in advance. Rentals are held on a first come, first served basis and require a credit card number or down payment. Cancellations must be made at least 48 hours in advance to avoid any cancellation fees. Failure to cancel scheduled rental times at least 48 hours in advance will result in your credit card being charged for our two hour minimum ($100). All renters are expected to finish working 15 minutes before the end of their booked time to clean up. Failure to clean up will result in a $25.00 fee. Glass is supplied up to 10 lbs per glory hole / per hour. Any glass usage above this allotment will incur a charge of $3.00 per pound. Glass usage includes work, crack-off and drip-off. Work must be picked up within five days or a storage fee of $5/day will be applied. Any work not picked up within 30 days will be considered abandoned and will become property of GlassRoots. GlassRoots offers artists the opportunity to purchase blocks of pre-paid hours at a discounted rate. In order to receive the discounted rate, you must pre-pay for 10 hours or more and pay for this block of time in advance. Rental slots can be reserved no more than 2 weeks in advance. All pre-paid hours must be used within 12 months. For those who seek to rent the shop on a regular schedule, you will receive an additional discount on our rentals rates. Please call GlassRoots Studio for pricing and scheduling availability. Our office is open 9 - 5 on business days. 973-353-9555. Renters will be asked to commit to a minimum number of days/hours and a rental agreement form will need to be completed before first rental. Longer cycles will be charged an additional fee. 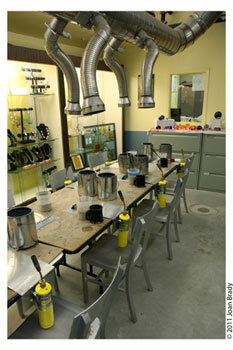 The kilnforming studio is available at $25 per hour/per person which includes 1 sheet of glass, tools and glasses. Each additional hour is $10/perhour. Hot Casting Time is available. Please contact GlassRoots to discuss availability and pricing. 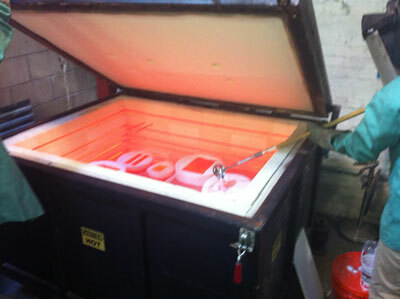 Molds are available for rent – contact GlassRoots staff for more information. 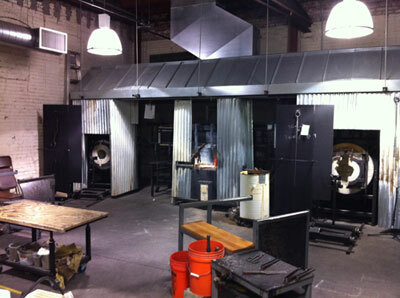 The flameworking studio is available at $25 per hour/per torch which includes glass rods, tools and glasses. This time must be scheduled in advance and is only available during regular operating hours. Please call for more information at 973.353.9555.